SwDb 0.1m is an application (presently in Beta) that can read, modify and write the supplementary frequency / schedule database file extra-swbc-sked.txt that DX ToolBox uses, and the file sdrdx-swbc-sked.txt that SdrDx uses if DX ToolBox isn't connected. Under OS X, SwDb's database files are maintained in your Documents folder. Under Windows, SwDb's database files are in a folder (which SwDb will create if it doesn't already exist) called Documents within your user directory. Only run SwDb out of the folder I supply it in. Don’t stick the executable somewhere else. That way lies madness. 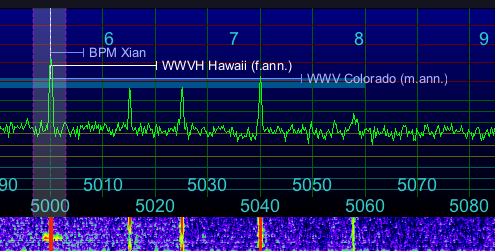 Looking the other way around, SdrDx takes information either directly from SwDb 0.1m or DX ToolBox and uses it to generate live station identification information on the main Spectrum. SwDb 0.1m allows you to completely specify a database entry with all the details about the station that the database supports, but you don't have to provide all the information. All you really need to create a useful label for SdrDx is the Frequency, the Time, and the Label. All the other editable fields can be left blank, and all the combo boxes set to None. However, if the station is not on 24 hours, and you enter the hours (in GMT) the station is on the air, then it will only appear in SdrDx during its on-air-time. This is very handy for SW stations, as they are almost never on 24 hours, but instead, one station will be on the air at one time, and another at another time. This helps give a much more accurate indication of what stations you might be hearing at any one time. The next time you tune to 1490 KHz, the WDLC label will appear. 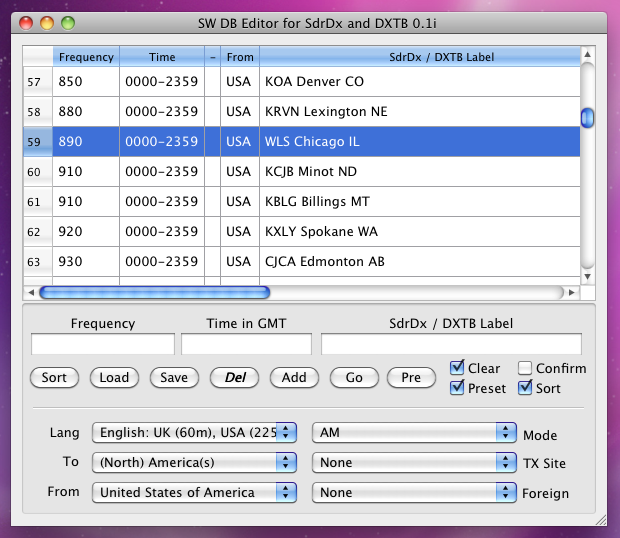 The main table lists all of the entries in the sdrdx-swbc-sked.txt file. When you load a new file, or change the information in it, this table reflects the new state. The table itself is read-only; it can only be manipulated using the controls below it. Sort sorts the database entries by the Frequency column. This is useful when you've added an entry to the table, but not yet saved it, or after saving, but without Sort After Saves turned on. Load allows you to (re)load a file on demand. This allows you to start fresh, or simply to load the backup file (sdrdx-swbc-sked.bak) if you think you've made a mess out of the current file. You can only load files in the SdrDx format. The DX ToolBox file extra-swbc-sked.txt and its backup are created as shadow files and are only usable by DX ToolBox. A "shadow" copy of the database is also saved under the name extra-swbc-sked.txt for use by DX ToolBox — this copy does not contain the demodulator field. Go turns the database into an unlimited memory store for SdrDx. First select one row by clicking the row number at the left; then press Go. This tunes SdrDx to the selected frequency, and, if a mode is set and DX ToolBox isn't running and connected, and you have saved a demodulator mode, it will also set the demodulator mode and the proper offsets for CW and FSK will be applied when tuning. Pre saves the state of all six drop-down menus as the after-Add preset. To use presets, set all six combos where you want them, then press Pre. Now check the Preset box. Now, after you press Add and the new information is added to the table, the presets will be used to set all six drop-down menus. This edit box allows you to enter a frequency in KHz. For instance, WWV is at 10 MHz, which is 10000 KHz, so if you were saving WWV, you'd enter 10000 into this edit box. Numbers from 1 on up are acceptable. Whole numbers only; for example, 14128.5 is not acceptable. As you enter digits, the table will scroll to the frequency being entered, or as near to it as it can. This serves as a quick check to see if you've already entered a station into the database. Frequency is a required field. This approach will cause the the data to show up during both the times specified, and not at other times. This is for providing the information that will be used to identify the station in DX ToolBox and SdrDx. This field must not be blank. Allows you to specify the language the station uses. Allows you to specify the region the station is broadcasting to. Allows you to specify the country that produces the broadcast. This is not always the country where the signal is actually being transmitted. This allows you to specify the country the transmitter is located in when it is not in the country that is originating the content in the transmission. With this set, you should then set the Tx Site control to the appropriate site within the foreign country. Caution: It's up to you to set the Tx Site and Foreign fields sanely. If you don't, any application that (eventually) tried to deal with that information may have a fit. Also, when you hit Del(ete), these two fields are not set from the file at this time. If you don't set this, then SdrDx will not be commanded to change demodulator modes. Clear , when checked, tells SwDb 0.1m to clear the three text entry fields after you press add. Sort , when checked, causes the table to be sorted by frequency immediately after the data has been saved. Confirm , when checked, causes dialogs to appear detailing the steps taken during the database file saves. Preset , when checked, tells SwDb 0.1m to preset the six drop-down menus to the settings that were in effect the last time you clicked Pre. SwDb 0.1m will automatically create this file for you. Note: You can learn about the codes that the sdrdx-swbc-sked.txt file uses (except for demodulator codes... that's a custom field for SdrDx) by visiting the database source page. This is some fairly detailed information; don't worry about it if the information seems unapproachable. The whole point of SwDb 0.1m is to make it so you don't have to worry about any of that unless you want to.